In September, I had the pleasure of attending not one, but two blogging conferences in my hometown of Sacramento, California. 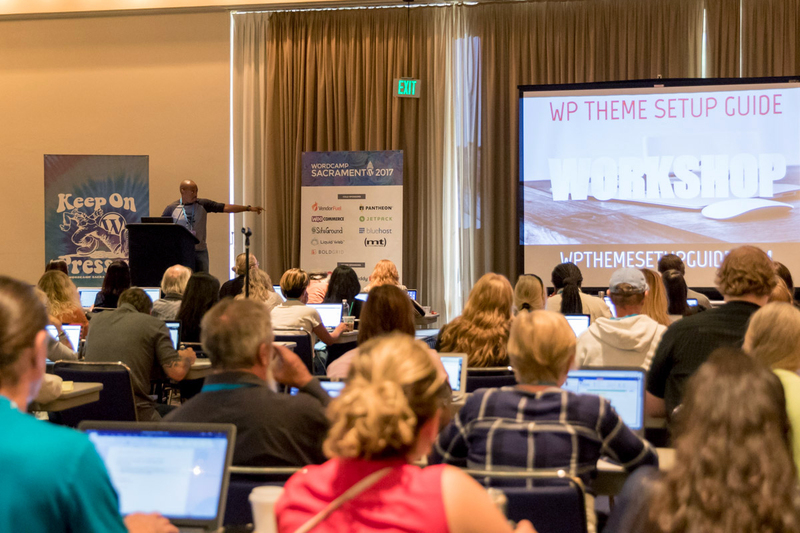 WordCamp Sacramento 2017 focused on WordPress developers and website design, but had an entire bloggers track. This alone brought in over 200 more attendees than previous WordCamps. 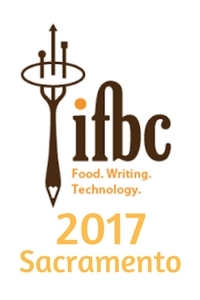 The International Food Bloggers Conference, aka IFBC, spent three consecutive years here in “The Farm to Fork” Capital of Sacramento, and travels to New Orleans in 2018. Last January, I shared some preliminary thoughts on attending blogging events in Need More Inspiration? Attend a Blogging Event. Before I share my four takeaways, here are some general thoughts on choosing a blogging conference. Having a blogging (or writing) conference come to your town is a huge gift. 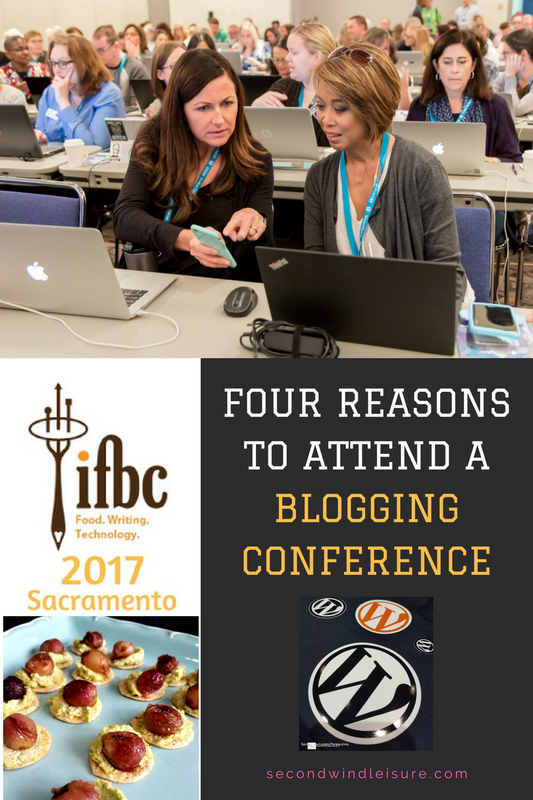 Through a Sacramento Bloggers event in 2016, I discovered the IFBC conference would be offered the following year. Although I wasn’t a food blogger, past attendees assured us there was enough general information that it would be wise to attend. 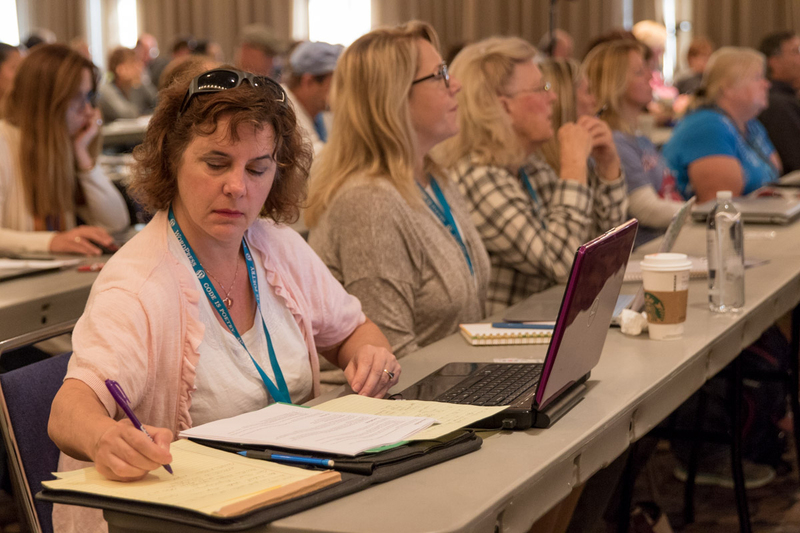 Although the IFBC was pricey, at over $300 for registration, the IFBC offered a deeply discounted rate to “Citizen Bloggers,” who agreed to share three blog posts before, during and after the conference. At a price under $100, I registered well in advance, not knowing what the sessions or agenda would be. 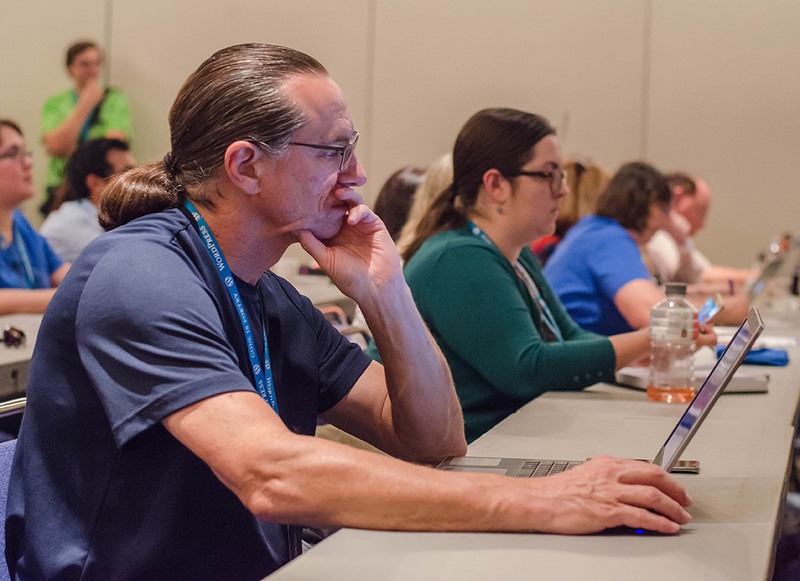 In April, again through my association with Sacramento Bloggers, we found out that Sacramento was hosting its third annual WordCamp, this time with an entire track devoted to beginner bloggers, and how to use WordPress tools. In case you don’t know, there is a difference between WordPress dot com (through Automattic, Inc), the free blog platform many bloggers use, and the WordPress dot org platform used on self-hosted websites. I have two sites: this one, Second Wind Leisure Perspectives, (you are reading here now) and my self-hosted website for my business Windigen Consulting. Registration for WordCamp Sacramento was an unbelievable $40 for the entire weekend. This is attributed to the amazing and generous sponsors! When I applied for and was selected to present on the bloggers’ panel “Blogging Success and Monetization,” my registration fee was FREE! Plus, all attendees received conference t-shirts, swag and a useful printed program. There was enough general information shared at sessions that I could apply to both this blog and my consulting website. Attending two local conferences almost back-to-back was a little tiring, but my drive to downtown was only a few minutes and parking rates for weekends were dirt cheap! Easy to meet others at a conference! Image from WordCamp. The main reason I attend conferences is to meet other bloggers in person, the actual folks with whom I have developed an online blogging relationship. Oftentimes, the world of a blogger can be a lonely place. It is a special treat to engage with other bloggers in person, who “get” you! And so nice to not have to type your reply for a change! Once you are registered for the conference, plan ahead and make some business cards for your blog, even if you just print them yourself. Network with others. Most conference-goers are easy to spot with their name tags. Do not be shy about introducing yourself to another blogger. Exchanging those new business cards is helpful and useful. At your table, say hello to those seated beside you. This may be difficult for some folks, but you can simply ask, “Are you a blogger,” or “What is your blog/website about?” Be prepared to answer this question, too. In one session, the presenter asked for everyone’s cards so she could send us her slides and information. Many folks had awkward slips of paper rather than cards, which could be mistaken for trash and did not present a professional look. I was glad I had mine! Find your new blogger friends on social media and follow them. Use your time to walk around and explore all the conference areas. At the IFBC, there was a huge swag (gift) table where we selected one of each item to take home at the end of the first day. There were some leftover goodies the next day and we were encouraged to take them. Be sure to meet and thank the conference organizers and sponsors. Most of these folks donate their time to put on these events. The sponsors and vendors also donated in-kind services and/or money to make the conference happen. One way you can also acknowledge them is by sharing their names and hashtags on Social Media. Most conferences encourage social networking during the sessions. While this practice is beneficial, I find it rather distracting to the presenters. Use this at a minimum while the person is speaking, besides, how are you listening to what they are saying, while your fingers are tapping away on the screen? There is plenty of time in between sessions to share. Do take photos of interesting conference items, like logos, t-shirts, session signs, displays, food, etc. Those make great sharing options for Instagram and Facebook where images are the key. Use the conference hashtag where possible while sharing. This is also a great opportunity to build your social media following, while following others. Some of these photos I used for this post! Attendees at WordCamp working alongside the presentation. 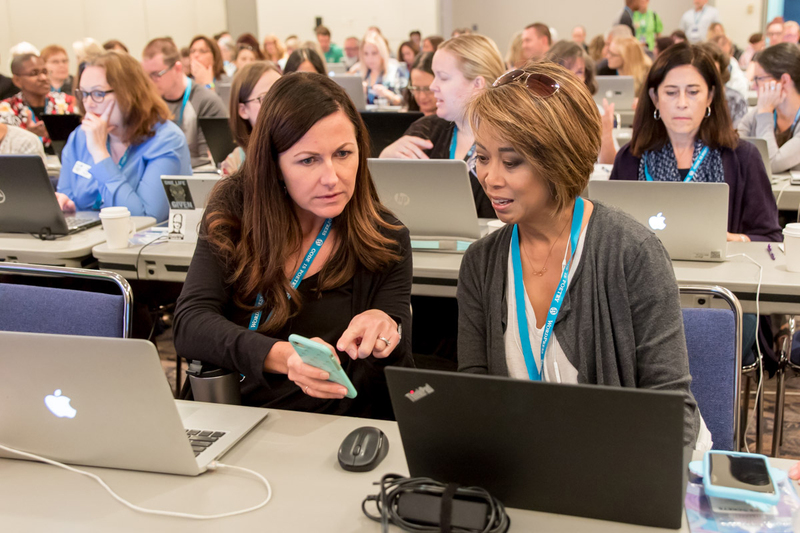 Attending a conference provides an opportunity for professional development and learn the blogging best practices from the experts. Both conference organizers sent e-mails on a regular basis with up-to-date information as the conference dates approached. Read the agenda and look at the sessions that interest you. Have a back-up plan if one gets cancelled (it happens). Ask yourself what you hope to get out of attending the conference. Attend sessions. Have you ever been to a conference and didn’t go to the sessions? Back in my work days, I saw this practice all the time. I never understood the point of spending money, then not actually learning something. Take notes. Conference attendees take session notes a variety of ways, whether by pen and notepaper, recording with a device, or by typing on a laptop. Talk with the presenters after the session, and take the opportunity to thank them and ask questions. Watch for follow-up e-mails from the conference organizers. Many presenters offered their slide shows in a shared format that all attendees could access. At WordCamp, professional photographers took lots of photos and shared them with attendees (that is how I got many of the images in this post). I’m told WordCamp images are public domain, so no need to attribute them to the photographers. This is often neglected, especially if you attend a conference out of town. Traveling home, you may be tired or needing to catch up at work, and you may be tempted to put your bag of notes and goodies away for a few days. Those nuggets of great ideas can easily be lost or forgotten. While taking notes, give yourself 1-2 actionable items from each session that you can implement within 24-48 hours. Put it on a to-do list, your day planner/calendar or sticky note or somewhere you can access it quickly. I sent myself a list in a calendar event with a nagging reminder so I wouldn’t forget. Following up with these notes is important, or why did you bother to attend? Get as much as possible out of your conference experience. At the IFBC, I heard two excellent speakers. One presented on “Massive Instagram Growth” and gave us actionable how-to items to implement quickly. Another speaker talked about SEO and provided excellent examples, as well as her slide deck at the end. I saw lots of folks snapping photos of these slides for later use! Those were my top four reasons. Here are some additional nuggets for you to consider. Have patience with the presenters. Although they are sharing their expertise on a topic, he or she is unlikely a seasoned speaker. Using a microphone and managing a laptop while speaking is frightening to many folks! Speaking from experience, it can be extremely nerve-wracking to stand in front of 100+ people and present, so take that into consideration and try to jot down the best nuggets of information they have to share. Many conferences provide a sharing link for all the slideshows used at the conference. If you just don’t enjoy a session and there is another offered concurrently, do not be afraid or intimidated to walk out of an uninteresting or irrelevant session and move on to another one if possible. You paid for this information when you registered and you have the right to move around. WordCamp speaker engages with his audience. Be sure to evaluate the conference and offer your feedback. If you were disappointed with something, take a moment to describe the issue in detail. At the end of the survey, there might be an opportunity to sign up to volunteer or present for future conferences, if that is something in which you are interested. If you do have to opportunity to present, you will likely get comped for the entire conference, so that is always a good incentive. I am glad I went. I hadn’t been to a professional conference since Bloggers at Midlife in 2016, and before that was when I presented at a work conference in 2013. I learned several actionable items and concepts as well as met many people I could ask for assistance if needed. Don’t miss the opportunity to attend a blogging conference in person. Keep checking your WordPress admin panel for updates on WordPress events in your community. Network with local bloggers, if possible, to see if other events are being planned. I also have an opportunity to meet with several fellow bloggers over Veteran’s Day weekend in mid-November as we converge in Southern California. I am very much looking forward to spending some quality time with these special friends.. I had no idea these WP conferences existed until Donna at Retirement Reflections commented on it. She sent me your link. Thanks for sharing this information. California is rather far for me to go to a conference, but I will be keeping my eyes open now for one that may be closer. Thanks. I just checked out the list of potential sites for 2018. There are definitely a few possibilities in there! Thanks, Tina, it would have been fun to see you at one of these! I love conferences! I haven’t been to a blogging conference, but I do attend a writer’s conference here in Madison every spring. It is good to get out of my office and meet people who know what I am talking about. I’m glad your conferences were useful. I love your advice to take action on a couple of things from each speaker immediately. It is easy to forget about things, and action is what makes things Happen. Thanks, Michele! Your writer’s conference sounds fun! So much information in this article, Terri. Thank you for sharing. I think your points are well taken in regard to attending any conference or class. Plan to learn and you will. Looking forward to the next post from you. Sounds such a wonderful event, Terri. Thank you for sharing all the information with us. It makes ‘The Bloggers Bash’ sound very small in comparison but, as you mention, networking is what these events are all about. If it hadn’t been for ‘The Bloggers Bash’ I probably would never have discovered ‘Press This.’ How did your presentation go? I only wish I was coming to Southern California on Veteran’s Day. I’m sure you guys will have a great day and I look forward to hearing all about it. Oh we would love to have you here, Hugh!! Thanks for the comments, and I believe the session went well. We had a chance to meet with bloggers after the session in the “Happiness Bar” and I was pleased to meet several people who had further questions. WordCamp Sacramento by far was one of the most professional conferences I have ever been to, considering it was completely volunteer-run! Love the title ‘Happiness Bar.’ And so glad that it all went well, Terri. I hope they invite you back to next year’s conference. Now you’re flying. I’ve been to two writer’s conferences and they have both been valuable for all the reasons you outline, Terri. I think meeting other writers and networking was probably the most valuable thing for me, and I like what you said about walking out of a session if it doesn’t suit you. I’ve always been a proponent of that in all the professional meetings I’ve attended through my nursing career, and I don’t hesitate to do this. It is important to get as much out of your experience as possible and some sessions just don’t live up to your expectations or needs once you get into it. Glad you had two to attend locally – how wonderful! I agree, Terri. Wish I could meet up with you! This is exactly why I really want to go to a conference sometime next year!! It’s on my bucket list. Now I just need to find one that will be perfect!! I hope you can find one, Jodie! I have never been to a logging conference, I’d like to though. It is on bucket list, I put it there because I am so introverted it is a little hard for me to be in a huge crowd. I did pin this post, so I will be prepared. Thanks, Leslie, I hope you can attend one soon! Hi, Terri – Thank you for sharing this. I definitely have ‘attending a Blogging LIst’ on my immediate Bucket List. I simply need to find a suitable conference that is available when I am. Do you know if ‘Bloggers at Midlife’ will be offering a 2018 Conference? I am very hopeful that they will! Not sure about BAM, but it is certainly worth attending events like this! Thanks, Terri. I definitely plan to pick your brain about this more when we meet. See you soon! I’m looking forward to our Desert Blogapalooza next month! Janis, good luck with your WordCamp event, hope they see the value of it! So looking forward to our time! It always helps to learn from the experts when possible, Lynn! I hope you can find an event! I found this very interesting, Terri. Blogging is not that big in South Africa and I have never heard of an event like this over here. Lovely to read a bit about what you learned. Thanks Terri. You make great points about the value of this type of conference (as well as great tips on going to any type of conference and getting the most out of it!). I will start looking for a local one on Blogging. Thank you, Pat, I hope you can find an event nearby!